In a microscopic feat that resembled a high-wire circus act, collaborating Johns Hopkins researchers and a scientist from Rockefeller University have coaxed DNA nanotubes to assemble themselves into bridge-like structures arched between two molecular landmarks on the surface of a lab dish. The team captured examples of this unusual nanoscale performance on video (https://www.youtube.com/watch?v=VETd3znn3eE&feature=youtu.be). This self-assembling bridge process, which may someday be used to connect electronic medical devices to living cells, was reported by the team in an article published online on December 19, 2016 in Nature Nanoteechnology. To describe this process, senior author Rebecca Schulman, Ph.D., an Assistant Professor of Chemical and Biomolecular Engineering in the Johns Hopkins Whiting School of Engineering, referred to a death-defying stunt shown in the movie "Man on Wire." The film depicted Philippe Petit's 1974 high-wire walk between the World Trade Center's Twin Towers. Dr. Schulman pointed out that the real-life crossing could not have been accomplished without a critical piece of old-fashioned engineering: Petit's hidden partner used a bow and arrow to launch the wire across the chasm between the towers, allowing it to be secured to each structure. "A feat like that was hard to do on a human scale," Dr. Schulman said. "Could we ask molecules to do the same thing? Could we get molecules to build a 'bridge' between other molecules or landmarks on existing structures?" The paper's lead author, Abdul Mohammed, Ph.D., a postdoctoral fellow in Schulman's lab, used another analogy to describe the molecular bridge-building feat they demonstrated at the nanoscale level. "If this process were to happen at the human scale," Dr. Results of an initial study of tumors from patients with lung cancer or head and neck cancer suggest that the widespread acquired resistance to immunotherapy drugs known as checkpoint inhibitors may be due to the elimination of certain genetic mutations needed to enable the immune system to recognize and attack malignant cells. The study, conducted by researchers on the cells of five of their patients treated at the Johns Hopkins Kimmel Cancer Center, is described in an article published online on December 28, 2016 in Cancer Discovery. The article is titled “Evolution of Neoantigen Landscape During Immune Checkpoint Blockade in Non-Small Cell Lung Cancer.” "Checkpoint inhibitors are one of the most exciting recent advances for cancers, but the mechanism by which most patients become resistant to these therapies has been a mystery," says Victor E. Velculescu (photo), M.D., Ph.D., Program Leader in the Bloomberg~Kimmel Institute for Cancer Immunotherapy at Johns Hopkins and Professor of Oncology. Clinical trials with the drugs to date have shown that nearly half of patients with lung cancers eventually develop resistance to this class of drugs for reasons that have been unclear. Checkpoint inhibitors, such as nivolumab and ipilimumab, approved by the FDA for use against lung cancer, metastatic melanoma, head and neck cancer, and Hodgkin lymphoma, help the immune system recognize cancer cells by revealing evidence of mutated proteins called neoantigens on the surface of cancer cells. To investigate why checkpoint inhibitors so often stop working, Dr. Velculescu; Valsamo Anagnostou, M.D., Ph.D., Instructor of Oncology at the Johns Hopkins University School of Medicine; Kellie N.
Apligraf®, an FDA-approved, bioengineered living-cell therapy from Organogenesis Inc., has become the first wound-healing therapy to demonstrate a significant change in the genomic profile of a treated non-healing wound, according to new research published in the January 4, 2016 isssue of Science Translational Medicine. The analysis from a multidisciplinary research team at the University of Miami, titled "A Bioengineered Living Cell Construct Activates an Acute Wound Healing Response In Venous Leg Ulcers," provides new insight on what happens to a wound's genomic profile when Apligraf is applied to a chronic venous leg ulcer (VLU), when compared to standard care with compression therapy alone. The analysis found that the application of Apligraf in conjunction with compression therapy altered specific molecular and cellular responses in the wound environment, converting the chronic wound profile to resemble an acute, healing wound profile. "This is the first time this type of detailed gene expression analysis has been conducted to evaluate the response to a wound-healing modality," said Marjana Tomic-Canic, Ph.D., Director of the Wound Healing and Regenerative Medicine Research Program at the University of Miami. "Our findings show that Apligraf can shift the gene expression profile of a chronic, non-healing ulcer to resemble a profile similar to that of an acute, healing wound. This is important as we now can use this as a guiding tool to understand healing of a chronic wound and mechanisms by which therapies can work." The research consisted of a prospective, randomized, controlled clinical trial that analyzed VLUs with less than 40 percent area reduction after four weeks of treatment with standard care with compression therapy. Treatment with an inhibitor of 12/15-lipoxygenase (image), an enzyme elevated in patients with Alzheimer's disease (AD), reverses cognitive decline and neuropathology in an AD mouse model, according to a new study published as a priority communication in the January 15, 2017 issue of Biological Psychiatry. The article is titled “12/15-Lipoxygenase Inhibition Reverses Cognitive Impairment, Brain Amyloidosis, and Tau Pathology by Stimulating Autophagy in Aged Triple Transgenic Mice.” The positive effects of the inhibitor were observed after the AD-like phenotype was already established in the mice, which is promising for the inhibitor’s potential therapeutic use, as neuropathology tends to develop many years before the appearance of AD symptoms in patients. The study, by senior author Domenico Praticò, Ph.D., and colleagues at Temple University in Philadelphia, Pennsylvania, offers some hope for a new treatment for patients with AD, who currently have no effective therapy options. Past research has focused on prevention of the disease by reducing the levels of proteins that cause brain plaques and tangles and kill nerve cells. "In this exciting new study, the authors provide support for a new experimental treatment approach that works by helping nerve cells digest toxic proteins that might otherwise cause cell death," said John Krystal, Editor of Biological Psychiatry. First author Antonio Di Meco, Ph.D., and colleagues used a triple transgenic (3xTg) mouse model that displays an AD-like phenotype, including cognitive decline, and Aβ and tau neuropathology characteristic of the disease in humans. The scientists had already shown that early administration of the 12/15-lipoxygenase inhibitor PD146176 could prevent the onset of these features in mice. A German multicenter study, initiated by the German Society of Nuclear Medicine, demonstrates that lutetium-177 (Lu-177)-labeled PSMA-617 is a promising new therapeutic agent for radioligand therapy (RLT) of patients with metastatic castration-resistant prostate cancer (mCRPC). The study is published in the January 2017 issue of the Journal of Nuclear Medicine and is the featured article. The article is titled “German Multicenter Study Investigating 177Lu-PSMA-617 Radioligand Therapy in Advanced Prostate Cancer Patients.” Prostate-specific membrane antigen (PSMA) is overexpressed in prostate cancer and even more so with castration-resistant disease. This makes development of new tracers for PSMA-targeted radionuclide therapies a promising treatment approach. Prostate cancer deaths are usually the result of mCRPC, and the median survival for men with mCRPC has been less than two years. "Previous studies with a small number of patients have indicated the high potential of this new therapeutic option," explains Kambiz Rahbar, M.D., University Hospital Muenster. "This study of a large number of patients at multiple healthcare facilities, however, confirms the efficacy and safety of Lu-177-PSMA-617 radioligand therapy." At 12 therapy centers across Germany, 145 patients (median age 73 years, range 43-88) with mCRPC were treated with Lu-177-PSMA-617 between February 2014 and July 2015 with one to four therapy cycles. A total of 248 therapy cycles were performed in 145 patients. Efficacy was defined by a prostate-specific antigen (PSA) decline of 50 percent or more from baseline to at least two weeks after start of RLT. Overall, 45 percent of patients had a positive response following all therapy cycles, while 40 percent responded after a single cycle. Some adverse side effects were noted but manageable. Type IV pili, essential for many pathogens to cause disease, are hair-like appendages that grow out of and are retracted back into bacteria cells, enabling them to move and adhere to surfaces. 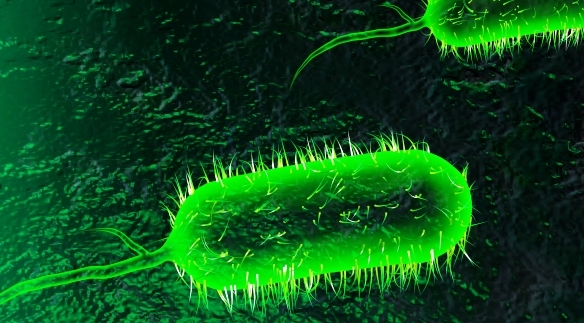 Although pathogenic bacteria often rely on a specialized molecular motor to retract their pili, a new study, published online on December 19, 2016 in PLOS Pathogens, reveals that a minor pilin protein elicits pilus retraction in the cholera bacterium, Vibrio cholerae. The open-access PLOS Pathogens article is titled “The Vibrio cholerae Minor Pilin TcpB Initiates Assembly and Retraction of the Toxin-Coregulated Pilus.” Bacteria utilize a number of highly sophisticated molecular tools to colonize their hosts. One of the most ubiquitous of these tools is a complex nanomachine called the Type IV pilus. This nanomachine has as few as 10 to as many as 30 molecular components, producing exquisitely thin filaments that extend from the bacterial surface and that can be several times the length of the bacterium itself. These pilus filaments have a remarkable array of functions that rely on their ability to (i) adhere to many substrates, including host cell surfaces, pili from nearby bacteria, DNA and bacterial viruses (bacteriophage), and (ii) to depolymerize or retract, which pulls the bacteria along mucosal surfaces, pulls them close together in protective aggregates, and can even draw in substrates like DNA and bacteriophage for nutrition and genetic variation. In collaboration with researchers from Dartmouth College and Simon Fraser University, Dr. Nicolas Biais, Assistant Professor of Biology at Brooklyn College, City University of New York (CUNY), developed an assay in his laboratory that revealed for the first time that the V.